I fired up the rig when I got home from work yesterday, and found a few takers on the bands. 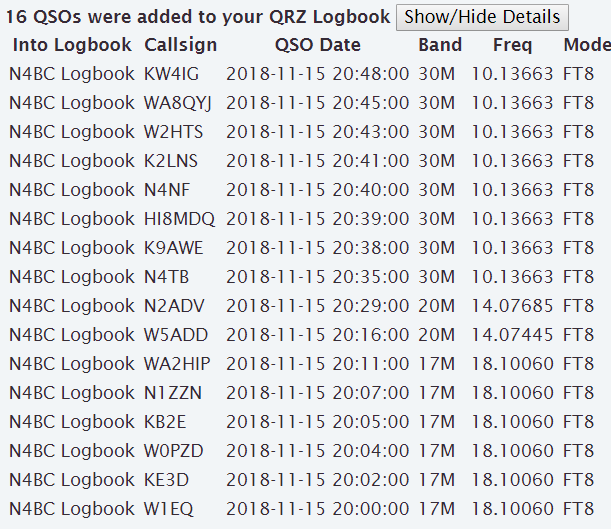 All of these were quickies (as are all FT8 contacts) … less than an hour for all sixteen. I was rushed, as I had to get myself ready and head out to my weekly Scout meeting and then choir practice … grabbing dinner on the way (Whopper combo). Not the healthiest dinner, but fast. After choir practice, I had to rush home for the weekly Tidewater DMR net (TG 31515). I joined only 7 minutes late at 9:07. Participation was good, with quite a few new check-ins, and lots of spirited conversation. Next week (being Thanksgiving Day) we’ll not meet. I can see this holiday season is stacking up to be hectic. Lots of events coming up … concerts, banquets, family events … you know what I mean. By the time the new year is here, you’re just glad for a break! The combined PARC/SPARK Holiday Dinner is coming up on Tuesday, December 4th at the County Grill in York County on Route 17. The food is always good there, and the company will be too! I see the ARRL November Sweepstakes is this weekend. This is the SSB one, and I am just not into SSB so I’ll pass. Furthermore, I’ve always thought the exchange was too involved and complex, so I’ve just never participated in the Sweepstakes events. If it’s your thing, more power to ya’. Just not my cup of tea. We had our regularly scheduled Tidewater DMR net last night, and had a handful of participants … maybe around a half dozen or so. Though small, it was a lively group. We discussed Tom’s (WE4TOM) presentation at the club meeting on DMR 101 … “DMR for the novice … by the novice”! Tom presented some good information, but the gem of the presentation was the demonstration that he and Howard (WZ4K) carried out. You know, you can descend into PowerPoint Hell but a hands-on demo is worth a thousand slides. Actually “fondling” the radios and listening to the voice quality really appeal to a ham’s baser instincts. You can hear for yourself what it sounds like … you can see for yourself how a hotspot works. Hands on … good stuff! They’re talking about taking it on the road to spread the DMR gospel! It’s been a while since I last posted, and quite frankly, I haven’t been on the air at all … life has gotten in the way. Problems with nursing homes, a death in the family, and a persistent cough and cold have conspired to make me silent, but I’m coming out of it now. Tonight is the club meeting. Tom, WE4TOM is doing a presentation on DMR, so that’s of interest. I’m looking forward to it. BAM! The holidays are upon us. I had to run into WallyWorld to grab some new windshield wipers for the truck and it’s CHRISTMAS in there! I STILL say Christmas sales shouldn’t start until after Thanksgiving at the earliest! I was right about the Win4Icom/N1MM+/WinKeyer USB problem … it was a port conflict. I had Win4Icom and N1MM+ both pointing to the same serial port for the WinKeyer. The simplest solution was to temporarily disconnect the connection from Win4Icom to the WinKeyer, and now N1MM+ works fine. If I’m not using N1MM+, I can just toggle the port back on in Win4Icom and all is well again … easy peasy! I rushed home from choir practice and caught the last half of the Tidewater VA DMR Net (TG31515). It was a small group tonight and Darrell, KF4HJW was doing the honors as Net Control. Don’t know where Howard was … hopefully he’ll be back next week. I downloaded the latest version of JS8Call this evening … JS8Call v0.7.5-devel. The main update is a fix for some decode issues, and there are several other fixes as well. Jordan, KN4CRD, is really responsive to feedback and the groups.io site is a good way to provide that interaction. Author dickPosted on October 18, 2018 October 18, 2018 Categories Computers, Digital, DMR, JS8Call, Nets, Problems, Programming, SoftwareLeave a comment on Eureka! Michael has come and gone now, and it was nowhere as bad as it could have been here at my QTH in Tidewater, VA. There were tornadoes and heavy rains all around us … to the South, West, and North … but most of the really nasty stuff was to the North of us. At the house, it was mostly high winds, rain, overturned trash cans, and lots of silver maple branches in the front yard. Many people are without power, but my power never failed. I did lose internet for about a half hour. When I look at the videos of the storm hitting the Florida panhandle, it’s sobering to see what Mother Nature can dish out. Of course, the internet dropout was in the middle of the weekly Tidewater DMR Net on TG 31515, so my hotspot became a nice paperweight with a pretty blinky red led. Before I lost my link, we had nine check-ins, and several regulars were absent, no doubt because of the storm. So, better luck next week! After the Net went away for me, I went ahead and got the DXLab Suite working with Win4Icom. Simple, really … just set up the virtual ports to interface with DXCommander and all worked well. I’m using two monitors and if I don’t judiciously manage what applications I’ve got open, I find I’m running out of room on the monitor desktops. You have to be creative in closing or minimizing and resizing windows on the monitors to keep things from piling up on top of each other. Today, things are getting back to normal. Michael is heading out to sea, and I’m at work, looking forward to the weekend (as I always do!). We still have generators running at our tower sites that are without power. My daughter, who is doing her practice teaching for her teaching certification/licence, has the day off, since schools are closed today (again!) due to trees down, minor flooding, and power outages.